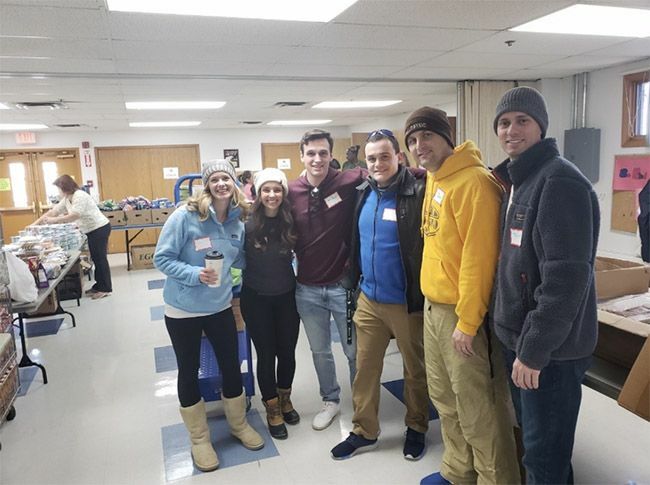 On October 10, 2018, the Will County Bar Association’s Young Lawyers Division volunteered at St. John Lutheran Church’s food pantry. Spesia & Taylor associates Jake Gancarczyk and Tyler Moore (co-chairmen of the YLD) and Mike Santschi and Jonathan Powell all attended, along with several other members of the Will County YLD. St. John’s food pantry hosts frequent food drives to support local families in need of assistance. Over the course of two hours, nutritious food was distributed to dozens of families. From left to right: YLD members Ashley Bechtold (Mahoney, Silverman, & Cross), Elma Dzaserbegovic (Larson Law), Jonathan Powell, Mike Santschi, Jake Gancarczyk, and Tyler Moore (Spesia & Taylor). The Young Lawyers Division is an organization within the Will County Bar Association that provides lawyers under seven years in practice with outreach, volunteerism, and networking opportunities. If you’re interested in joining, contact Tyler Moore or Jake Gancarczyk today!